Bahamas, Nassau night11 - Mon Petit Garconne | Cosa Mi Metto??? A walk trough the amazing gardens of the Atlantis resort, to watch closely the sharks, the rays and many other species that inhabit the waters of the Bahamas; then a glass of wine at Nobu: a perfect program don't you think?! I don't know if I mentioned it before: I'm allergic to fish, but of course Luca isn't and this is the reason of my visit to Nobu!!! What do you think of this graconne-look? I'm in love with it!Have a great week end! Una passeggiata tra i fantastici giardini dell'Atlantis resort, per guardare da vicino gli squalotti, le razze e molte altre specie che popolano le acque delle Bahamas; poi un bicchiere di vino da Nobu: un programma perfetto, non credete?! Non so se ve l'ho mai detto prima: sono allergica al pesce, ma ovviamente Luca non lo è ed ecco il perchè della mia visita a Nobu!!! Che ne pensate di questo look da garconne? Io lo adoro! Buon fine settimana! 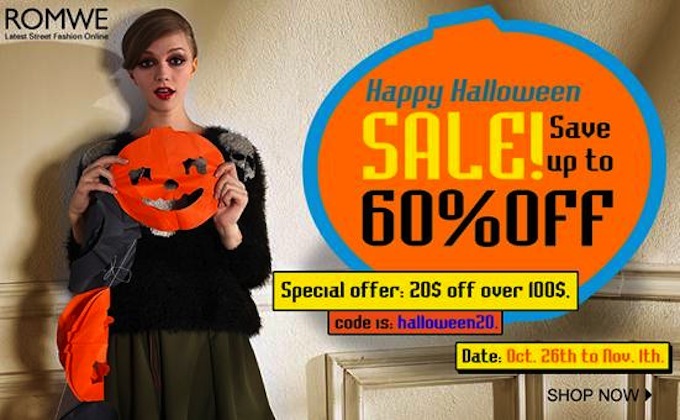 Before leave you, I give you a great news: as you can read on the pictures Romwe Halloween Sales have begun! Prima di lasciarvi voglio darvi una bella notizia: come potete leggere nella fotografia i saldi di Halloween di Romwe sono iniziati! Molto carina! la borsa è bellissima. Adoro sia la forma sia il colore! Love your shoes & great outfit. Stai molto bene. Mi piace tutto. Un baci. Che vacanze da sogno che hai fatto!! Molto belli i pantaloni. Mi piacciono!! bellissimo look, mi piace molto il pantalone!! mi piace molto questo look garconne, allgergica al pesce? o povera!!! Gorgeous as always! You look very chic! Really love the white striped pants! Adoriamo la clutch e le scarpe!!!!! che bella tesoro!! sei uno spettacolo!!! Questo è un look molto miami style!!! Mi piace molto il cappello!! Very chic look! You look great! So jealous of your clutch! You look stunning. thanks again for your comment on my blog dear and yes, we can follow on twitter, fashiolista, etc. Mi piace molto la collana! Beautiful outfit Fabrizia, you are so chic! wow you are beautiful! love the pants! You've such amazing hair! I love the look with the cute hat! Looks like you're having a great and very stylish time :) Love the shoes!! A really great look and a amazing location, sounds like the perfect place to be! those pants you are wearing are wonderful! i love what you paired them with too! You outfit is spectacular and beautifully co-ordinated. Casual and really chic outfit..